Multiple heavy storms this week have my friends complaining, “Enough water!” but by some fluke of nature, promising dark clouds bypassed my neighborhood day after day, time and again. So this afternoon when a nice steady rain started up, I welcomed it readily. One benefit of the need to be out watering yesterday morning was the enjoyment of seeing bees and hummingbirds sipping from the flowers. 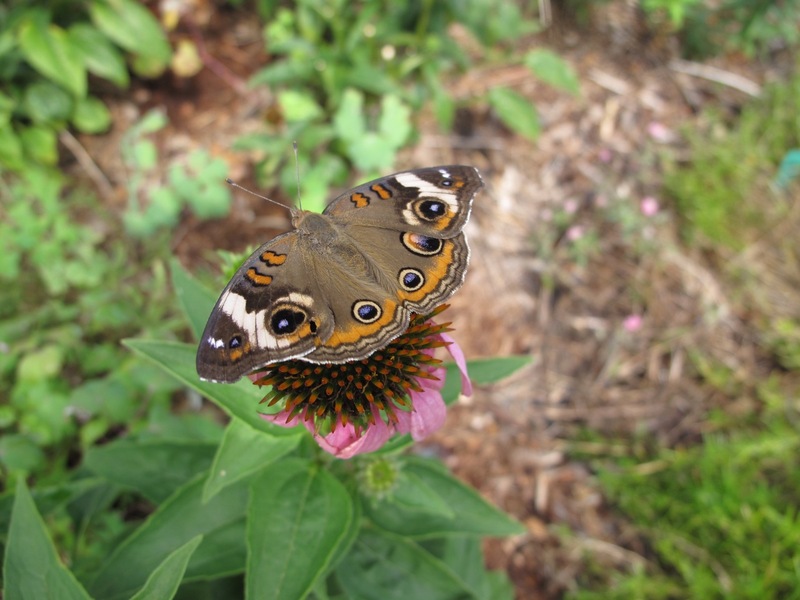 I also spotted a beautiful butterfly atop Echinacea purpurea, so came back out later with my camera. I welcome corrections because my identification skills are woefully undeveloped and potentially unreliable, but according to me, this one is Common Buckeye (Junonia coenia). Common Buckeyes are found all over the United States, except in the Northwest. And supposedly here in the south where I live, they are well, rather true to their name, common; however, I do not see them commonly, so one picture was not enough. When the butterfly is fresh its eye spots have a lavender tint. Here the butterfly is sharing politely with a bee. There is a little sliver missing from its upper left wing. 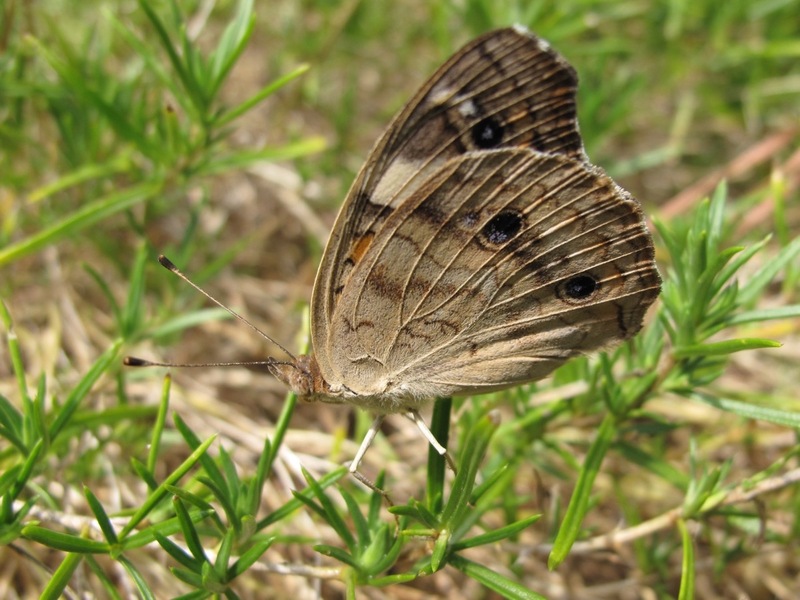 Eventually the butterfly drifted toward the ground to light upon Phlox subulata (Moss Phlox). 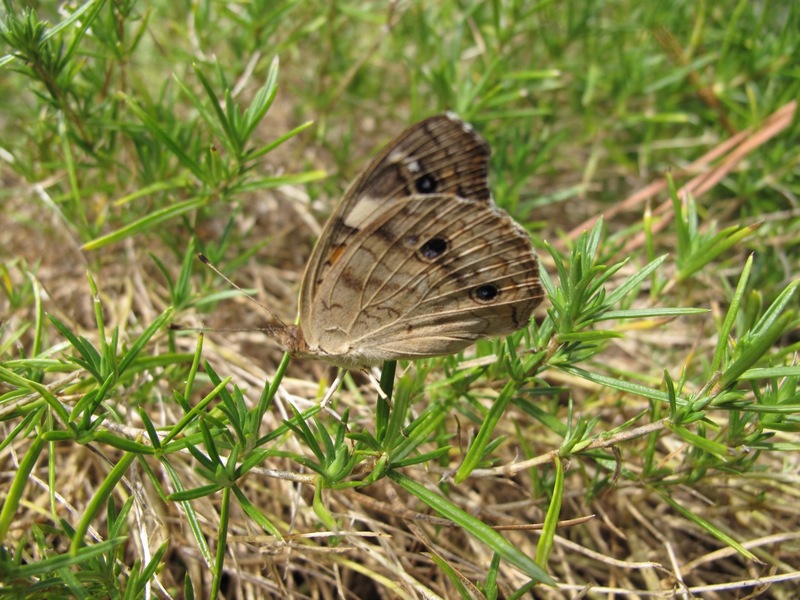 Its ventral wing coloring is lighter in spring and summer, helping to camouflage itself. In fall and winter the color darkens to a rosier hue. 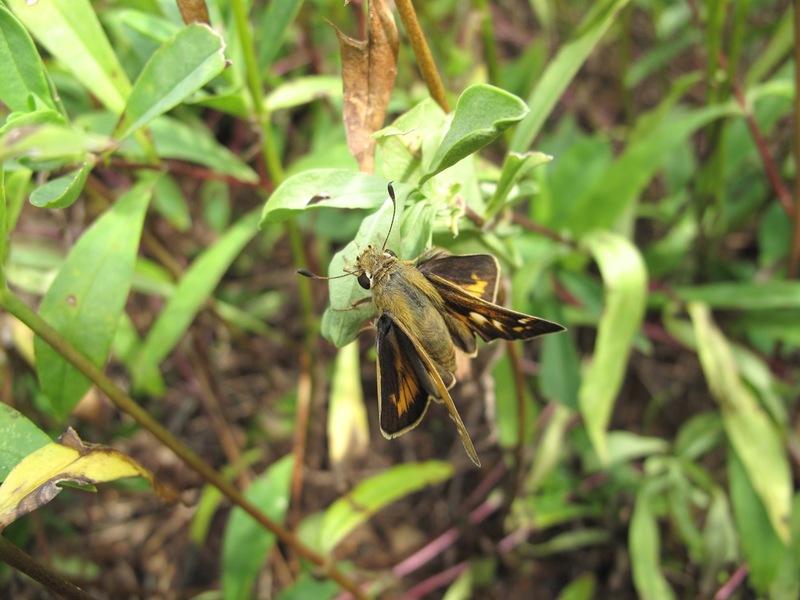 Another insect that caught my attention yesterday was the Fiery Skipper (Hylephila phyleus). It is also is found abundantly in this area of North Carolina. For the longest time I tried to discern shades of coloring and markings (chevrons, smudges, spots?) to identify if this is male or female. Still not sure, but I am guessing female. The club-shaped ends of the antennae are black on the outside and orange on the inside. I will close with a look at one flower I am especially enjoying this week. It is a striking shade of my favorite garden color—blue. The black calyces and stems add contrast and drama. 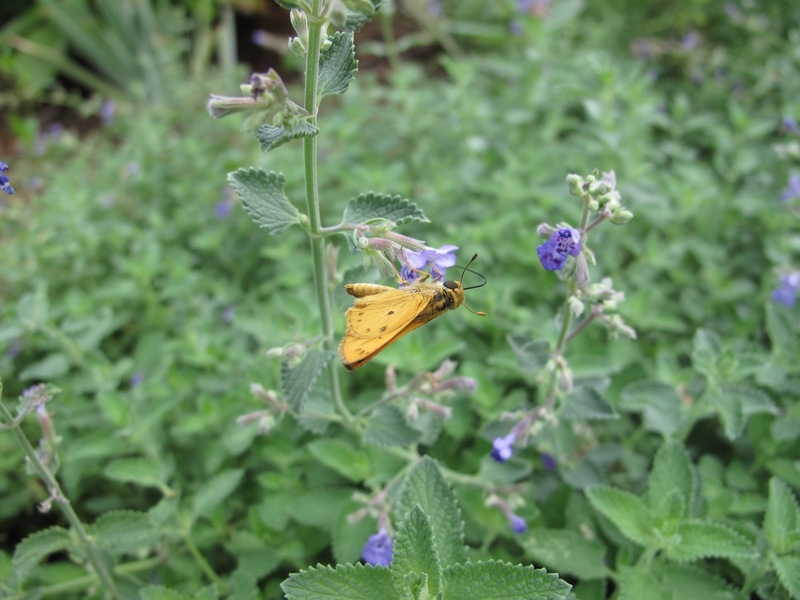 This entry was posted in garden and tagged Common Buckeye (Junonia coenia), Salvia guaranitica 'Black and Blue', summer garden on July 3, 2015 by pbmgarden. Stunning photos of your beautiful butterfly, it doesn’t matter that they are common, their markings are a work of art! I love it once the butterflies start fluttering round the garden, we sometimes get a skipper here but a different one from you. 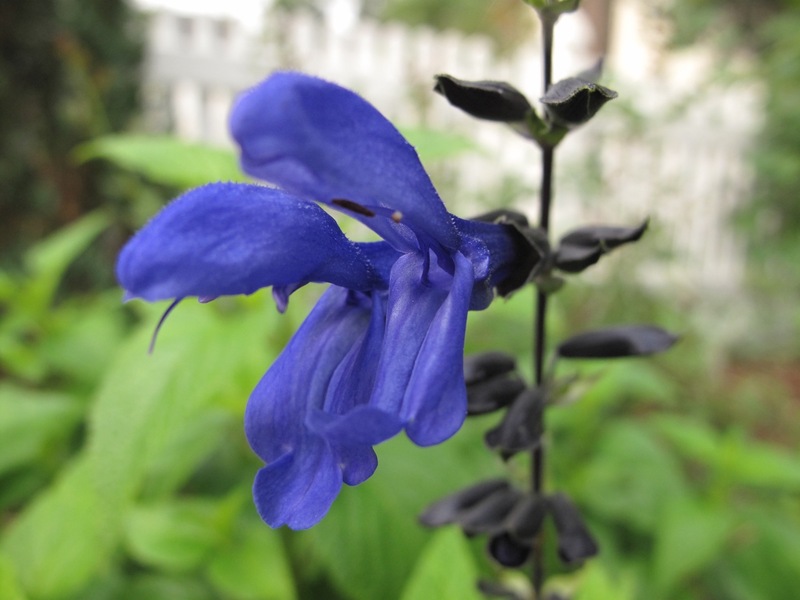 Love your Salvia, such a beautiful shade of blue. Thank you so much Pauline. Nature has such expressive, abstract patterns, doesn’t it? I hope these are correctly identified, but certainly they are beautiful. Susie, love this post, you have taken some wonderful photographs, but especially photo 5, its a cracking shot! 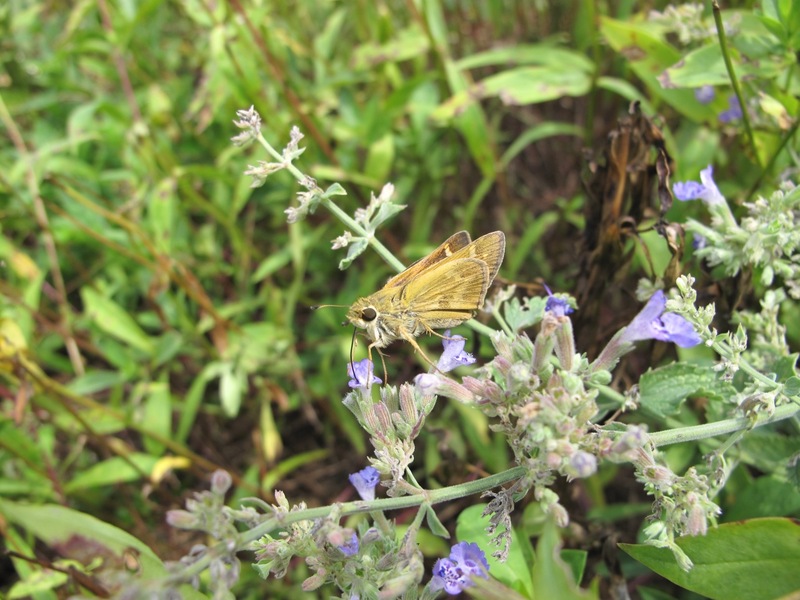 Your Common Buckeye is very handsome and the Fiery Skipper has a great name. Glad you are getting some rain too. Oh Julie, thanks. I really like that photo too. The rain this afternoon was a nice one. It’s funny (and frustrating) hearing my friend describe the biblical quantities of rain they’d been getting, while we were dry as a bone. Thanks! Enjoy those Monarchs–they are mesmerizing. They travel through here in late summer/fall, but last year the numbers were very small. Lovely shots of your butterfly. I haven’t seen that one before. It certainly does have stunning markings. 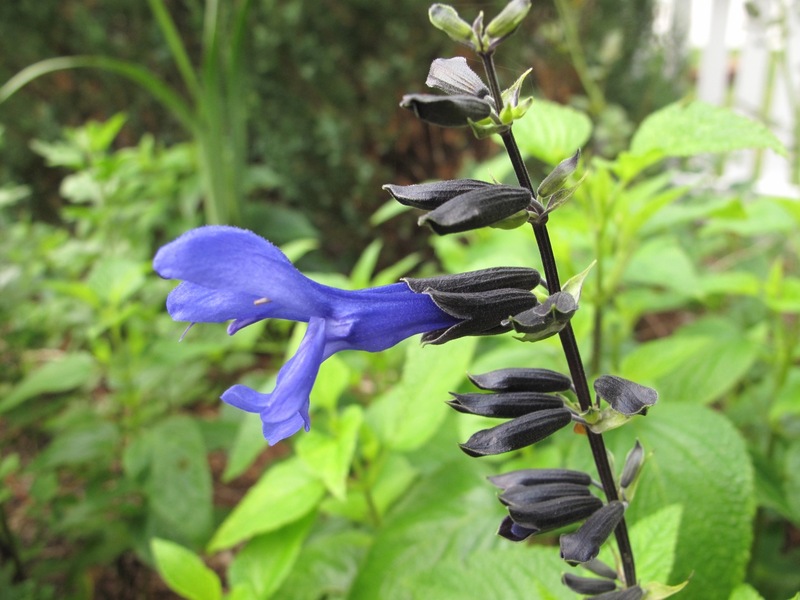 The salvia is rather special too. I enjoyed this post – thanks. Thanks Annette, so glad you enjoyed it. I rarely am able to get such cooperation from butterflies. I love that blue salvia. If I had any pull in the butterfly world, I think I’d start a petition to remove the word ‘common’ from its name. Beautiful for sure. Yes, I agree Judy. Common is quite a burden for such a lovely creature. 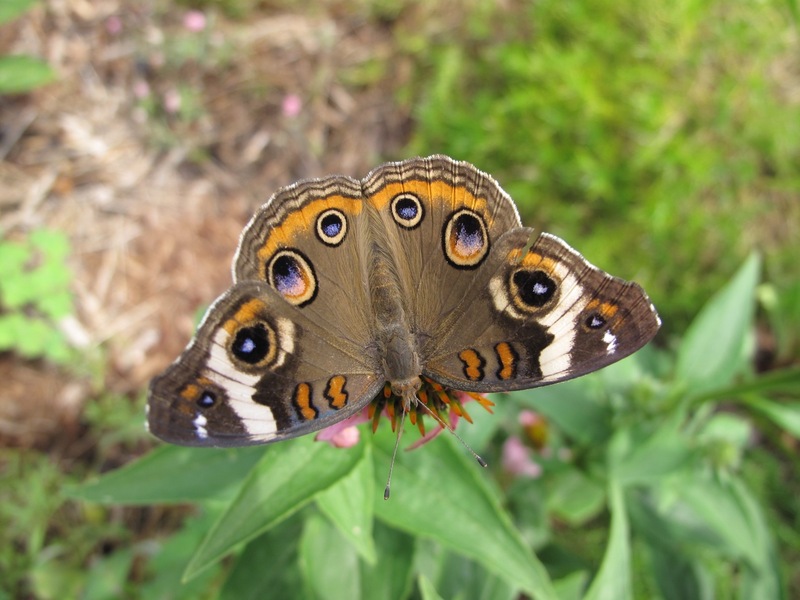 Your common buckeye is uncommonly beautiful, dressed down in its elegant tones. Thanks Rickii, it deserves some praise. Now that I’ve paid attention to one, hope I’ll see more around. Butterflies are so hard to identify I think. 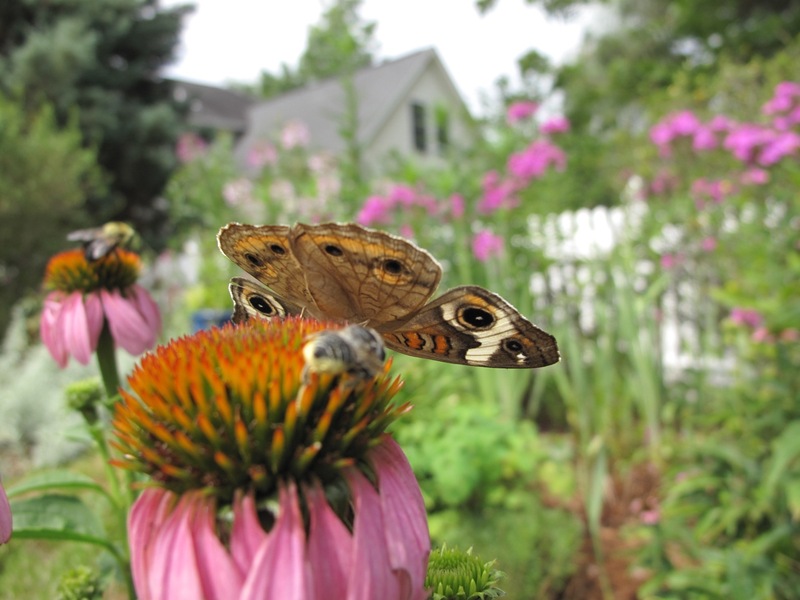 great photo’s, I have just planted an Echinacea and look forward to more butterflies in my garden in the coming months. Thanks! Bees will enjoy your Echinacea (as will you). What beautiful photos. I am always amazed at the detail of butterfly markings. You were lucky to have him be so patient. Glad you got some rain. Thanks Stephi. Must have been that tasty echinacea that kept the Buckeye posing for me. Rain–yes, such a relief. Exquisite photos. I think butterflies really bring a garden to life. We had a good downpour here in the UK south east last night and after record temperatures this week it was very welcome. Thank you–butterflies are pure delight. Glad your garden had a thirst-quenching drink. We had another rain overnight thankfully. How did you get such great photos? I can never get my camera fast enough. Just a lucky day John. Hope you’ll see many butterflies this summer. 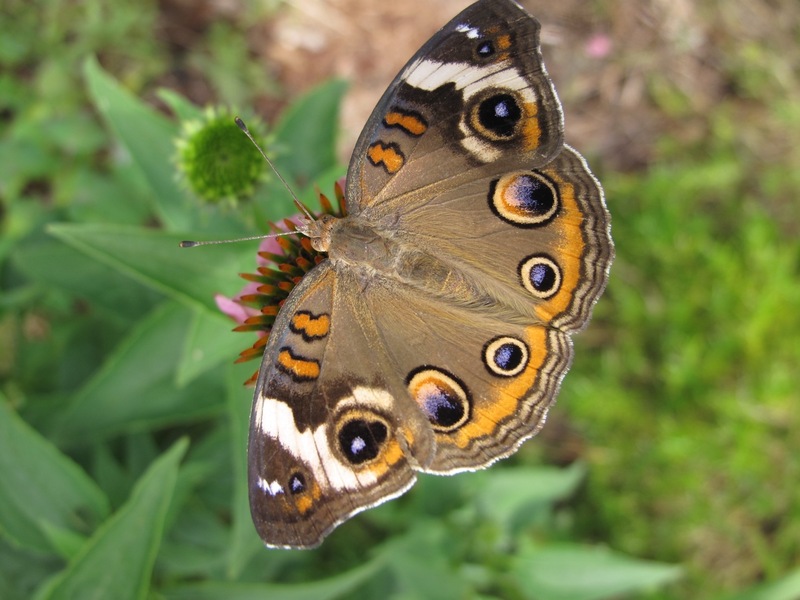 Your pictures of the Common Buckeye are beautiful. I wouldn’t have stopped at one either! Hurray for some rain. We are finally get a little here in East Anglia too. Thanks, I enjoyed seeing that Buckeye, but no sign of it since then. Glad you had some rain. Great photos! We don’t have the buckeye butterflies, at least not in my garden. Interesting that this is one of the butterflies that is more colorful when it spreads its wings. Thanks. One idea is those elaborate eye spots scare off predators, but I don’t know. First rule of the garden – welcome all bees and butterflies! Beautiful shots, thanks for sharing! Yes, they’re welcome here. Thanks. It’s been so rainy this summer that I haven’t seen as many butterflies but did see a huge swallowtail the other day. I love the buckyeyes, too. So dry here until recently. I love the swallowtails too. Hope your rain moderates a bit. You have a vibrant and beautiful garden, I like. Thanks. I agree, patience is necessary to enjoy the butterflies and maybe that holds true for the whole of the garden. 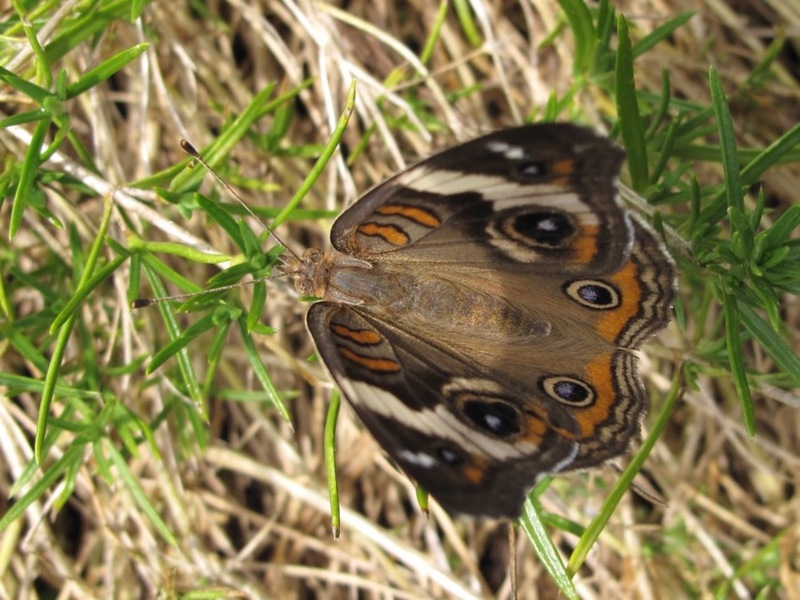 Your Common Buckeye is an exquisite butterfly I have never seen one before. Wonderful photography. One of my favorite salvias…fabulous color. And I would welcome he Buckeye butterfly but never see them here….now I have snapdragons this year so maybe! 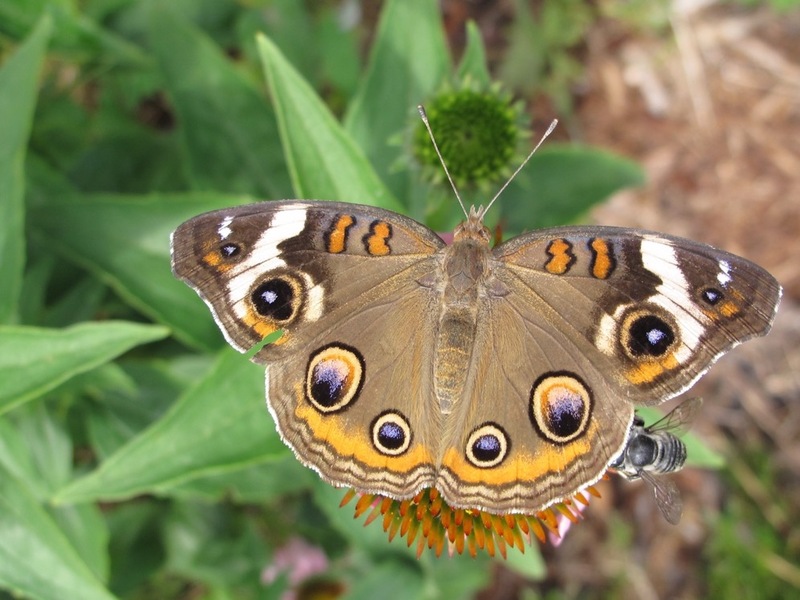 The Common Buckeye is so cute. I wish we had them around here. Great photos of them. I was excited to get these photos of the Buckeye (and glad it had such strong markings to help me identify it).